This book is written from the perspective of a grandfather who suffered the death of a beloved granddaughter. In dealing with his suffering, he addresses these questions: What reasons does he have for trusting God’s love, goodness, and providence—even when prayers go unanswered? Why does he grieve, but not without hope? Is perplexed, but not in despair? Why is he justified in trusting the Word of God as a reliable source of knowledge? 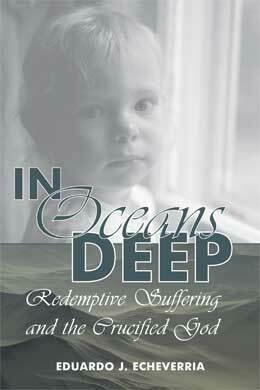 Experiencing suffering and evil is like being up to one’s neck in deep water, in oceans deep as it were. Yet, God’s grace abounds in deepest waters by virtue of the cross and resurrection of Jesus Christ, who “brings redemption not only to my suffering but also meaning to my death.” This book is written from the conviction that “There is not a single aspect of the Christian message that is not in part an answer to the question of evil” (Catechism of the Catholic Church §309). “In this volume, Eduardo Echeverria brings to bear his extensive theological erudition on a problem that seems intractable: innocent suffering. The author takes the reader on a profoundly insightful tour of the major themes which cluster around this crucial issue: the authority of God’s revelation; the problem of evil; the meaning and triumph of Christ’s cross; redemptive suffering; and the mystery of death. In five briskly written chapters, Echeverria responds to the question: How can innocent suffering be reconciled with the goodness of God revealed in Jesus Christ? His theologically rich response provides a deeply thoughtful meditation on Christian faith and theology—and on the Divine Love at their foundation. As your introduction to In Oceans Deep, an excerpt is available for you to sample on your iPad/iBook or any other ePub reader.